Hauser & Wirth in LA’s Arts District is a mecca for art lovers on the West Coast. Their current exhibition, Calder: Nonspace, brings the iconic works of one of America’s most notable 20th-century artists to life in a decidedly unique curation of 30 sculptures from 1939 to 1976. The indoor/outdoor show weaves this thread throughout the entire building, incorporating the South Gallery, as well as the expansive outdoor courtyard. Inside, a collection of black kinetic mobiles and maquetes punctuate an all-white interior, emphasizing the artist’s ability to create a delicate dialogue between movement, composition, and space. These smaller sculptures act effectively as sketches in metal, which Calder later used to create larger works. This monochromatic presentation is contrasted by the towering steel sculptures found in the courtyard. ‘Feuille d’arbre’ (1974), an immense mobile stands twenty-feet tall, commanding the space. Presented for the first time in the United States, the work seems completely at ease beside a native Californian oak tree, oscillating in the gentle breeze. Flanked by two additional large-scale sculptures, the space certainly captivates its audience. 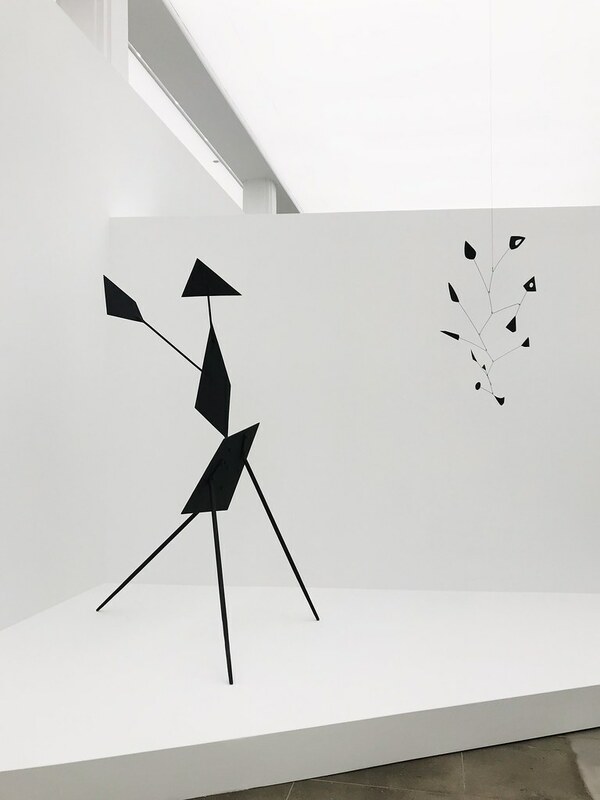 Calder’s pioneering approach to movement in modern art and ultimate invention of the mobile continues to challenge the way artists explore the theme today. His kinetic sculptures remain his most iconic legacy and still evoke wonder with their audience. This dynamic exhibition invites both the well versed and the uninitiated to step inside the artist’s world, explore his approach, and share a moment with his incredible works. Calder: Nonspace is open now until January 6th at Hauser & Wirth, 901 E 3rd St, Los Angeles.